"Or else what, a monster's going to squirt goopy goo all over my face, huh, Ulrich?" — Élisabeth "Sissi" Delmas, Code Lyoko, "End of Take"
What is the first hint that a giant monster, yet unseen, is towering over some characters, or clinging to the ceiling above them? No, in most case, the very first hint they'll ever get of this menacing presence is... some liquid splashing over their heads or shoulders. Most often drool, though it can be other secretions. Sometimes this drool is acidic, and they're really in trouble. May be also the blood or remains of the monster's last victim for extra fun. In a way, an organic form of *Click* Hello, typically followed immediately by Oh, Crap!. See Rain of Blood if the dripping involves blood. Also see Phlegmings. If the characters are inside a Cave Mouth, they may realize in horror that this is the cause of that drippy sensation. Not to be confused with Perverted Drooling. Compare Dripping Disturbance. The disgusting Licking Woman from Junji Ito's Black Paradox series. In Delicious in Dungeon, Marcille the elf receives some slime on her head falling from the ceiling, but the early warning isn't enough for her to avoid a Blob Monster on the face. Happens twice in Mahou Sensei Negima! with the same occidental dragon in the underground beneath Mahora — first with Yue and Nodoka, then with Chisame getting drooled over the head — before they even notice the monster. Moribito: Guardian of the Spirit: Torogai runs into a cave in Nayug, seeking an escape route. Something splashes onto the floor beside her, and she realizes she's run into a trap. She gets out anyway... through the worm creature's digestive tract. Ick. In one of the extra pages installments of the Skip Beat! manga, Maria has a rather large, remote-controlled, robot spider she uses to scare off women who get too close to Ren. Guess how she introduces it. Go on, guess. In Soul Eater, Eruka has a hallucination (one of several various characters have) of the Kisin doing this while she and Free are trying to revive him. A textbook example in PS238, when Malphast accidentally summons a tentacle... thing from a portal opening in the ceiling. It naturally drools on Tyler. 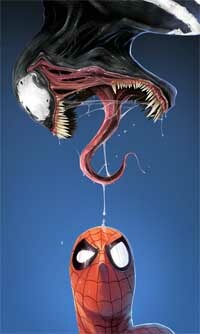 Spider-Man: As shown above, Venom is fond of this, particularly with Eddie Brock in the '90s. Makes: a madd'ning drip-drip-dripping sound. In Memento Vivere, a Final Fantasy X fanfiction, this is how Rikku meets the Chocobo Eater. In Alpha and Omega, the bear slobber on Humphrey after he accidentally hurts the bear's child. Hoodwinked semi-parodies this with when Granny is hiding up on the ceiling. A single drop of sweat falls right next to the Big Bad, and though he doesn't see it he realizes she's there because the drop smells of hairspray. Hotel Transylvania: A harmless (and very cute) version of this happen during the prologue — while Dracula is overseeing the plans for the movie's titular hotel, a blob of saliva splatters onto the blueprints. When Drac and his contractor look up, it turns out that the drool came his (then-young) daughter, Mavis, who happens to be playing on the ceiling. The Land Before Time: The Secret of Saurus Rock: Although Cera's companions see the Sharptooth standing right behind her, she doesn't notice it (thinking it's a gag) until it starts to drool on her. The Alien franchise is pretty fond of this one. Whenever dripping saliva onto the victim won't signal a Xenomorph's presence, the warm air exhaled onto the victim's neck from behind will. And if that happens, it's already too late to run. In Bad Moon, it happens to the forest ranger before he is killed. This happens in the 1988 version of The Blob, just before the Blob kills the quarterback. There, it is slime from the Blob itself, making it much worse. The Borrower: Variation, where the Not Quite Dead alien hunches over a coroner working at a table and starts dripping blood next to her. In Braveheart, before Lochlan is thrown on Robert the Bruce's dinner table from above, there is blood dripping onto the bread served. Deep Rising. As the remaining group of survivors discuss what to do next, one of the monsters drips slime/drool onto the comic relief's shoulder. The comic relief proceeds to spaz out and opens fire on the monster, causing it to split and spill out the partially digested (but still alive) remains of another character. In Grave Encounters, Sean and the gang find a human tongue on the ground... a few drops of blood quickly alerts them to the tongue's owner. In the Harry Potter and the Philosopher's Stone movie, the gang is alerted to Fluffy's presence by his drool on Ron's shoulder. Notably, they're aware he's there; the drool just lets them know he's awake. In the first Hellboy movie, this is how the title character (and the audience) is introduced to the demon Sammael. An interesting variation in The Hobbit: The Desolation of Smaug: The dwarves realize Smaug is crawling through a chasm directly above them when a coin drops from the dragon's underbelly and lands on the bridge they're crossing. I Still Know What You Did Last Summer. Frightened teenager peers into her closet. Seems like a red herring, until blood drips under her feet and out pops a bloody hung corpse. Journey to the Center of the Earth. In the 2008 version, Sean Anderson hears a noise and hides behind a giant boulder to escape the threat. Said prehistoric threat drools on him while leering down above the boulder. As things go south in Jurassic World, a dinosaur containment team is sent after the GPS tracker implanted in the Indomitus Rex. They find the tracker lying on the ground in a chunk of flesh — the I. Rex remembered where they implanted it and dug it out — and as the team leader ponders this, a drop of fresh blood splats onto his arm, he slowly looks up... Subverted- the blood drip was just from where the Indominus had bled onto a plant while the creature itself was using its camouflage ability to hide in the background. In King Kong (2005), during the Brontosaurus stampede, Bruce Baxter takes cover against the wall of a ruin... only to be drooled upon by a hungry Venatosaurus above, about to attack him, forcing the actor to flee again. In The Last Starfighter, Alex Rogan gets a couple of these from a Zando-Zan, the interstellar hit-beast who's working for Xur and the Ko-Dan Armada. In Little Alvin and the Mini-Munks, a drop of water splatters the page of the book Lalu is reading to Alvin and Brittany. It's revealed to be Simon, who's all wet from toilet water. Happens indirectly in Men in Black. After K enters the morgue to find out what's happened to J, he tries to light a cigarette but the match is put out by a drip of slime. He looks up and sees the attendant glued to the ceiling by the Bug's secretions — a warning that the Bug is present in the morgue. In The Maze Runner, on his first outing in the Maze, Thomas is stalked by a Griever (spider-like cybernetic monster) climbing above between two walls. He's warned of its presence by some slime dripping on his shoulder, a mere second before it attacks. One of the parasites in Parasite makes its presence known to the motel owner by drooling on her hand from the above before attacking her. In the first film of the Spider-Man Trilogy, Spider-Man almost gets discovered by Norman Osborne when blood drips from a wound on his arm he got in a fight with the Green Goblin earlier, as he hangs from the ceiling. On Agents of S.H.I.E.L.D., episode "The Only Light in the Darkness", blood dripping onto Skye's tablet shows her where Koenig's body is. Angel episode "Parting Gifts". Wes informs Angel that the demon he's chasing can be tracked via the Alien Blood it's leaving behind... like the kind that's now dripping on his shoulder. The Day of the Triffids (2009). After Torrence launches his takeover bid, Mason and Cocker are taken out to the woods to be fed to triffids. An armed mook is ordering them out of the back of the truck when triffid venom drops on his shoulder, then one of the Man-Eating Plants yanks him screaming into the air. In an episode of Lost, as Kate is looking for a wounded Naomi in the forest, a drop of blood on her shoulder warns her that Naomi is in a tree above. Not soon enough to avoid the ambush, though. In an episode of Sanctuary, a nosy journalist notices a corpse dangling above her when some blood drips on her face. Subversion in Star Trek: Deep Space Nine: There is one episode in which the liquid dribbling from the ceiling is a dead shapeshifter (their true form is liquid). Subverted again in Star Trek: Discovery, in "The Runaway": The dripping is revealed to be blood dripping from an alien castaway's wound. The alien doesn't want to fight and immediately retreats to a new hiding place. Sort of in The X-Files. In "Squeeze", Scully is alerted to the fact that Tooms in in the air vent when a bit of bile drips out of the ceiling. Subverted in Welcome to Night Vale episode "Antiques", in which Intern Hector is turned into an antique monster after being bitten by an antique. When he gets into the recording booth and begins drooling on Cecil from the ceiling, Cecil knows exactly what will happen if he looks up, and keeps his head down until he has gotten out of the booth and locked Hector in. In The Girl of the Golden West (a play before it was an opera), Minnie is trying to hide the wounded Johnson in a loft from Jack Rance, who is also the sheriff and comes looking for him after having shot at him. She is just saying goodnight to Rance, and he holds out his hand to her, when a drop of blood falls on it from the boards above. Minnie says that she must have scratched him, but then another drop of blood falls from the loft on his hand, betraying Johnson's hiding place. The Xenomorph in Alien: Isolation has a habit of hiding in ceiling vents. A very difficult-to-spot trickle of drool dripping down from the vent is your only clue as to the fact that it's there. If you start getting drooled on, well, heads up. This is Eddie's introduction to the Lamprey in Brütal Legend. He decides to to take a cigarette break while waiting for Ophelia to get the gate that's blocking their path open when some goo drips down on the cigarette and extinguishes it. He turns around and finds himself face-to-face with the monster they were hoping to avoid. In the opening chapter of Dino Crisis 3, the hapless McCoy gets covered in mutant tyrannosaurus drool just before the latter chows down on him. Early on in Metal Gear Solid 4: Guns of the Patriots, Snake is alerted to the presence of a Gekko by the drips of blood coming from its latest victim. The first time Samus meets the Zeta Metroid in Metroid: Samus Returns, it is shown doing this, with an appearance similar to the xenomorph from Alien. Happens in a StarCraft I cutscene: Fenix is walking along a hallway when slime drips onto him. He looks up... to see two hydralisks coming after him. In Wing Commander Prophecy, the first hint Commodore Blair gets of an alien waiting to pounce on him, while he's trying to shut down the alien wormhole gate before getting swarmed by the Nephilim, is its drool landing on the rifle he was carrying. In Snatcher, blood drips from the ceiling in Cunningham's office. Upon glancing up, you see his Snatcher grimacing back at you. In Intragalactic, the Roboticist is alerted to Ben's presence by a drip of ice cream . The author also outlines the trope in the commentary section. In Kevin & Kell, Lindesfarne glumly notes that it's raining — until she realizes that this is no rain, it's the drool of several hungry cougars. Happens to Vaarsuvius from The Order of the Stick in the strip aptly titled "Good to the Last Drip" . It is seawater here, but the effect is the same, as it's the first hint that a giant dragon sneaked on the elf (besides an imp's weak attempt at a warning). In Stand Still, Stay Silent, Emil meets his first troll when its lower jawbone, a bucket's worth of blood and some yellowish bodily fluid fall on top of his head . See the next page for the troll itself. There's a variant in Zebra Girl where the victim is smoking, and the monster coughs . Happens to Sissi in the Code Lyoko episode "End of Take" with an Alien-ripoff puppet controlled by XANA, added to a helping of Tempting Fate a few seconds before, providing the page quote. On the Monster Buster Club episode "The Trouble with Troublemaking", the kids are alerted thrice of the presence of Gluten (an alien slaver, vaguely humanoid Blob Monster) above them by some goo dripping. "Do Princesses Dream of Magic Sheep": In a dream that's about to turn into a nightmare, Fluttershy's first hint that the giant Angel Bunny has turned monstrous is his drool falling on her head. "Stranger Than Fan Fiction": While in a Temple of Doom, Quibble Pants is ranting about how "unrealistic" the adventure there are in is... oblivious to the Cipactli (a mythological mix of toad and crocodile) rising behind him until big droplets of mud fall on him. Then he turns around, and starts to realize this is all too real. "To Where and Back Again  Part 2": When Starlight Glimmer (actually, Thorax the changeling in disguise) enters the main throne room of the Changeling Hive, she doesn't see anyone here until a drop of goo falls on her head. Looking up, she sees all her friends (including Discord and Trixie) imprisoned in cocoons. And then, Chrysalis's laugh echoes. Lisa Simpson gets one in The Simpsons episode "Treehouse of Horror VIII". After discovering the tiny Bart-Fly and learning of Fly-Bart's intention to kill the former, she claims that she's not scared by the creature. Cue slime dripping on her revealing Fly-Bart has been watching her from the ceiling for some time. In The Spectacular Spider-Man, a bystander attempts to hide from the Lizard's rampage through a subway station by ducking into an alcove. Cue the drips of saliva falling on her head. She manages to survive via Spider-Man's timely intervention. Steven Universe: "Reunited" has a non-drool example. While Blue Diamond is occupied with Garnet's distraction, a few water droplets suddenly fall on her head. She looks up, seeing the barn floating above her in a giant water-bubble. Enter Lapis Lazuli, who uses her hydrokinesis to drop the entire barn on Blue Diamond's head. Michaelangelo is the drool-ee in the Teenage Mutant Ninja Turtles (2003) bonus episode "Mayhem from Mutant Island". The drool-er is a mutant dinosaur right behind him. Captain Tim (that's what Wander calls it, at least) in Wander over Yonder has a thing for crawling onto the ceiling and dripping metal-corroding acid. None ever actually hits Wander or Sylvia, but they do get many close calls.